FrV November 23, 2016 December 1, 2017 No Comments on Vaping Kills? Why Does This Guy Hate Vaping So Much? 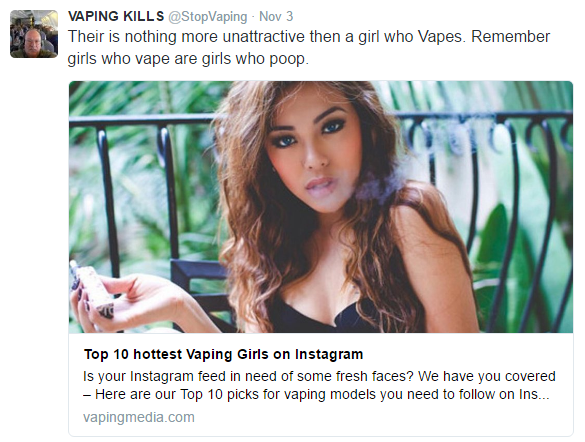 “Vaping Kills!” How’s that for a Twitter handle? Sorry, but there’s no prize available if you’ve guessed correctly and realize this guy is a member of the vape-hate brigade. Smoking kills! That’s a fact. Everyone knows it. 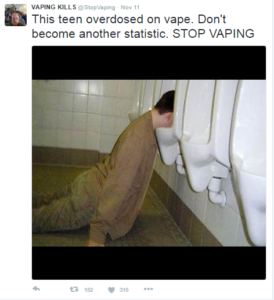 Vaping saves lives, a lot of people know that as well. Unfortunately the media continually paints vaping in such a bad light many smokers have been brainwashed into believing there is no point in making the switch because vaping is as bad. All of the vape-hate propaganda is easy to dismiss, but still the deception goes on. So far the media is only guilty of misrepresenting study results, but Twitter user Vaping Kills is telling barefaced lies. The big question is : What’s this guy been smoking? There are no studies to support any of his statements. Nor have any vape-related deaths been reported in the news. And when Charles Whitman went on a killing spree at the University of Texas he used guns, he didn’t burst through the doors and start handing out vaporizers and bottles of Fruity Pebbles flavoured e-liquid. So why is this guy so busy spreading the hate? It could be for any number of reasons. Thought Catalogue has a list of reasons why people hate, so let’s do a poll. Why is This Guy So Full of it (hate)? Because he things vapers have something he doesn’t. Because he has nothing better to do with his life. Because he is unhappy with his life. Because he is a bigot. Because he sees himself as a self-righteous, moral high priest. Because he has to put people down to feel good about himself. Because he can’t get laid.